With this lucid translation of Du litteraire au filmique, André Gaudreault’s highly influential and original study of film narratology is now accessible to English-language audiences for the first time. Building a theory of narrative on sources as diverse as Plato, The Arabian Nights, and Proust, From Plato to Lumière challenges narratological orthodoxy by positing that all forms of narrative are mediated by an « underlying narrator » who exists between the author and narrative text. 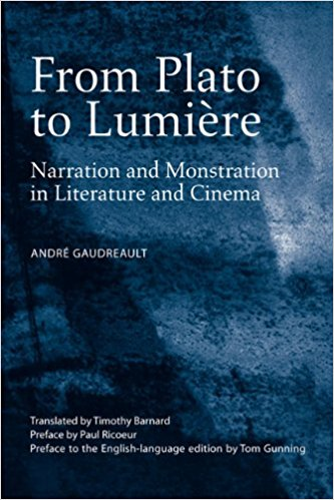 Offering illuminating insights, definitions, and formal distinctions, Gaudreault examines the practices of novelists, playwrights, and filmmakers and applies his theory to the early cinema of the Lumière brothers and more recent films. He also enhances our understanding of how narrative develops visually without language – monstration – by detailing how the evolution of the medium influenced narratives in cinema. From Plato to Lumière includes a translation of Paul Ricoeur’s preface to the French-language edition as well as a new preface by Tom Gunning. It is a must-read for cinema and media students and scholars and an essential text on the study of narrative. Ce contenu a été mis à jour le 23 juillet 2018 à 23 h 05 min.